This little e-mail hit our desks today, finally giving a date for when TouchWiz would slide onto Samsung's Galaxy Tab 10.1. We've seen TouchWiz on phones before and had mixed feelings; but this is an entirely different beast, as this will be the first opportunity to see a manufacturer's skin over top Honeycomb's frame. We'll find out how useful the Live Panel and Mini Apps that come with this new TouchWiz UX are at a press event being held next Wednesday. 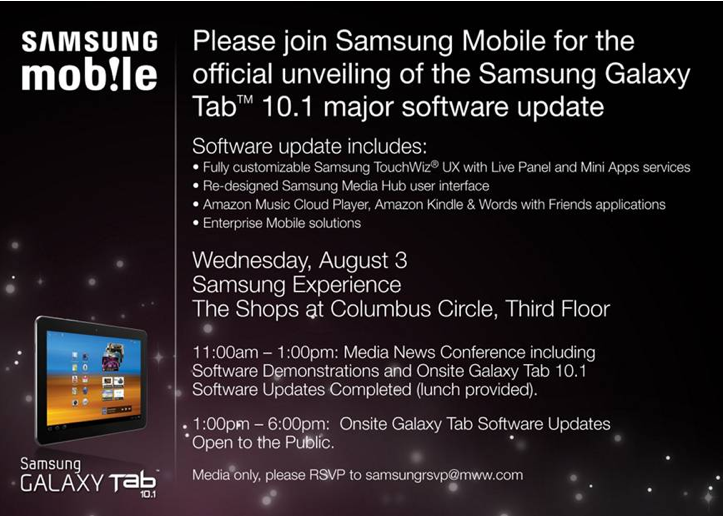 After the event, the public is welcome to stop by with Tab's in tow and have the latest firmware sideloaded onto their devices. No word on when a more traditional Over-The-Air update will be available, but we expect the ROM to be hitting XDA's forums before lunch is served. We'll be their to cover the event and update as needed.